You can access to an image properties by simply selecting it. Properties are shown in the bottom-right part of the editor by default. You can then modify the image file, its name, choose if the image must be smoothed (''True'' by default; deactivate this option if you want a pixel-perfect display) and if the image must be kept in memory (useful with drawing actions and if no objects use the image). To add a folder, right-click and choose **''Add a folder''**. 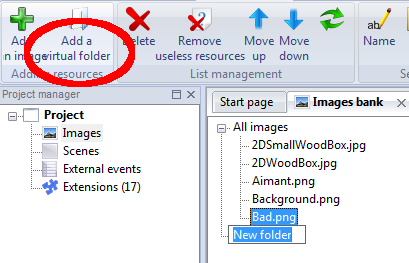 You can rename the new folder by right-clicking it and choosing **''Rename''**. To add an image to a folder, right-click on the folder and choose **''Add an image''**. A window will appear and let you choose a file. The image will be added to the folder and to the **''All images''** folder. You can remove an image by right-clicking on it and choosing ''**Remove from the folder only**''. The Image Bank contains all images used by your game. The top-left part of the editor contains an image list, and the bottom-right part shows a preview of the selected images. As explained below, you can organize images in folders. Right-click on an image to access other properties and to copy, cut and paste it. Multiple folders can contain the same image, and all the images in your game are visible in the All images folder. You can search an image by typing a part of its name in the search box display on the bottom part of the editor.